...adults with and without intellectual and developmental disabilities share life and friendships in community. In the L'Arche Atlanta community, people with intellectual and developmental disabilities (who we call core members) are not clients, patients, or recipients of services. Instead, they are friends, teachers, and companions, who, through daily acts of care, trust, and friendship, develop into ambassadors of compassion and leaders for social change. We are different ages, come from different home towns, have different family backgrounds and faith traditions but share a desire to live a full life, be loved as we are, and, by sharing our gifts, to blossom into our most authentic selves. Assistants provide personalized care in a family-like home environment. Though L’Arche assistants are not medical professionals, they are trained to administer medication and to recognize potential medical conditions. Health care professionals,government agencies, and advocates in the disability field herald L’Arche as one of the best providers of community-based care for people who have intellectual disabilities. What makes the difference? The emphasis on mutual relationship between core members and assistants creates an environment of love and trust where quality care is not just a job, but a matter of friendship. Families with adult children with intellectual disabilities, and an ever‐growing number of people without disabilities who are drawn to our mission, come together for fun events where the sole purpose is to celebrate the gifts of people with disabilities. 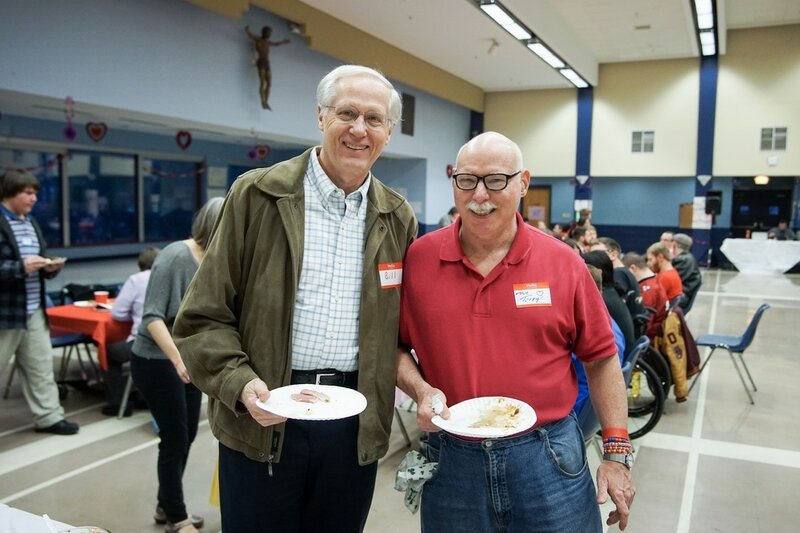 Aware that so many families desire a place of belonging, L’Arche hosts community events to provide experiences of belonging to these families as an extension of the mission that flows from the life in our home. These events include dances, talent shows, community meals, BINGO nights, and concerts. Families attend because they find encouragement and hope in L’Arche. In 2017, over 400 people attended our open community events. ​Find out about our next community event here. You can read more about our advocacy efforts here. If you want to know more about L'Arche Atlanta, a great place to start is reading our 2017 Annual Report! Because the L'Arche model is unique, people often have questions. L'Arche International has attempted to answer the questions most often asked. You can read these here.